-Dual Band: Alternative 11AC(5.8Ghz) and 11N(2.4Ghz) connections for TV shows, HD movies, streaming, and online gaming to avoid wireless interference. -433Mbps Wireless Speed at 5.8Ghz band or 150Mbps Speed at 2.4Ghz band. -Support Soft AP mode to create a Wi-Fi hotspot. -Mini & portable design for easy carrying, it's convenient to use. -Supports 64/128-bit WEP, as well as WPA/WPA2 and WPA-PSK/WPA2-PSK encryptions . -Supports Windows XP/Vista/win 7/win 8/win 10/Linux/MAC operating system . 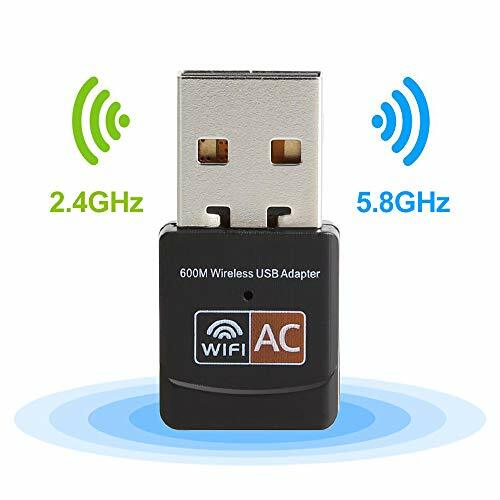 -Complies with IEEE 802.11n (Draft 2.0), IEEE 802.11g, IEEE 802.11b standards . Dual Band: Alternative 11AC(5.8Ghz) and 11N(2.4Ghz) connections for TV shows, HD movies, streaming, and online gaming to avoid wireless interference. 433Mbps Wireless Speed at 5.8Ghz band or 300Mbps Speed at 2.4Ghz band. Support Soft AP mode to create a Wi-Fi hotspot. Mini & portable design for easy carrying, it's convenient to use. If you have any questions about this product by Diffingle, contact us by completing and submitting the form below. If you are looking for a specif part number, please include it with your message.